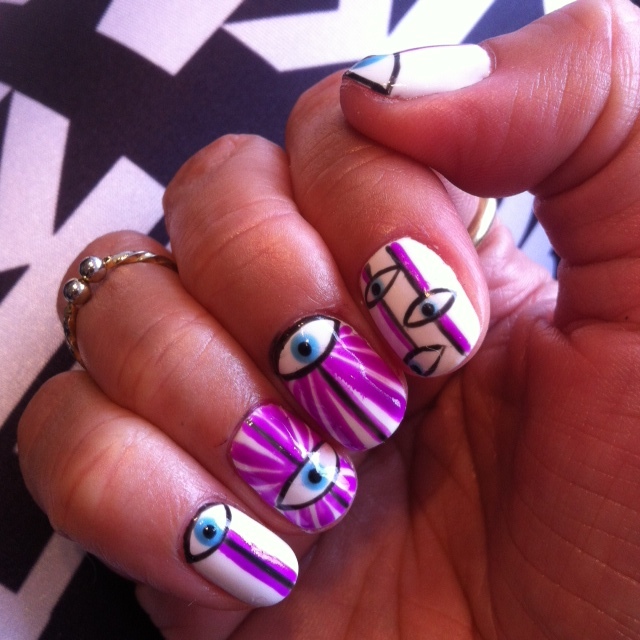 Nail-art craving: I’ve been into the evil eye look (I had this evil eye manicure in the fall, remember?) and I thought it’d be appropriate for my “marathon manicure” for the Around the Bay 30k race I’m running this Sunday. The evil eye will ward off any ill will, and help me avoid that Grim Reaper dude who’s always near the end of this difficult, hilly race. I also like the graphic patterns designer Mara Hoffman is known for, and mentioned this to Leeanne Colley at Tips Nail Bar earlier this week. How I satisfied that craving: Leeanne ran with the idea and created this flashy, graphic nail art for me using Shellac Cream Puff anbd Black Pool and Gelish You Glare I Glow (I forget the colour used for the blue eyes). It took two hours of painstaking work by Leeanne, she’s amazing–always makes sure each detail on the nail is perfect. How this nail art makes me feel: Protected. Invincible. Love it or hate it: LOVE. Bring it on, Around the Bay and your crazy hills. I’m ready. Thanks, Lindsay! I think I need you to do my nails one day — your nails on instagram are cray!